From the age of just 19 I realized that I was already losing my hair. Due to the fact that I am incredibly vain, I immediately wanted to slow, if not stop, the process of baldness.I consulted The Hair Centre some 2 years ago and after a meeting with one of their Trichologists I started a Programme treatment using Vitastim and a combination of prescribed tricho-active shampoos. Initially, I was very sceptical as I am sure most people are, but what the hell, it’s only money, and if it actually worked, well, then it’s money well spent. This course, although slowing the balding process, did not stop my hair fallout. However, in the last year or so I have started using Biostim with Vitastim twice a day. I am now delighted to say that my hair is thickening and, believe it or not, growing back! The wonders of science. 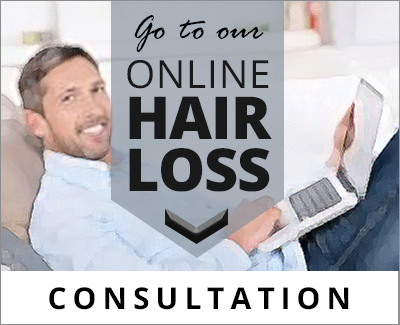 Do you have a problem with hair loss? Let us help you like we have helped others. Please do not hesitate to contact us on 0207 976 6868 or Click Here To Email Us if you are unsure of anything or require further advice regarding your treatment. Having used the No.2 cream and No.4 shampoo for just a few weeks for psoriasis, I was very surprised how quickly these products worked after years of struggling with this complaint. The overall condition of my hair and scalp improved greatly and I found it very reassuring to know that only natural products are used in the manufacture of The Hair Centre products. I feel very satisfied and that I am in professional hands. Do you have a problem with hair loss? Let us help you like we have helped others. Please do not hesitate to contact us on 0207 976 6868 or Click Here To Email Us if you are unsure of anything or require further advice regarding your treatment. In 1999 I made an appointment to see my doctor because I had discovered a couple of bald patches at back of my head right on the hair line, they were about 2 to 3 inches in diameter, I was panic stricken and didn’t know what to do. The growth rate of my hair had also slowed down considerably. My doctor diagnosed that I had alopecia areata and prescribed a steroid cream. I was told that my condition was stress related. After having used the cream for sometime my condition worsened with the largest patch getting larger and starting to meet up with 2 new patches that I had not had before, these other patches appeared behind each of my ears. I had been using the cream diligently for 6 months. Frighteningly, the only other alternative treatment my doctor could offer me was steroid injections into the patches on my scalp, which I refused. Meanwhile, a friend of mine had told me about this fabulous new website called The Hair Centre. Being a naturally suspicious person this prompted me to telephone them for advice, as by now I was beginning to get worse and starting to feel desperately depressed as I could see my appearance deteriorating almost daily. I spoke to this really helpful trichologist, who informed me that the cream prescribed by my doctor was completely useless and would probably cause further damage because it was a strong and aggressive steroid. After a long conversation about my condition the trichologist advised me to use the Vitastim hair re-growth stimulant in conjunction with the No.1 shampoo and No.5 conditioner. I started to use the stimulant twice a day at home. I also used the No.1 specially formulated shampoo for hair loss and No.5 intensive hair recovery conditioner three times a week as directed. My hair loss slowed up and stopped almost immediately (3 to 4 months) and the condition of my hair and scalp had vastly improved. I am delighted to say that 12 months on I have fully recovered. Although, it has taken a long time (12 months) I am extremely pleased with the results. My hair is growing at its usual rate, all of the patches I had, have completely re-grown and my hair feels normal again. I have no hesitation in recommending The Hair Centre trichologically balanced treatments and shampoo products, really are first class - they are the best. Do you have a problem with hair loss? Let us help you like we have helped others. Please do not hesitate to contact us on 0207 976 6868 or Click Here To Email Us if you are unsure of anything or require further advice regarding your treatment. I have been suffering from male pattern hair loss for the past 12 years. But it wasn’t until about 18 months ago when I literally stumbled on to The Hair Centre's website that I actually now know how you inherit genetic hair loss and how it develops. When I first visited the site I was impressed by the technical back up and that I could speak directly to a qualified professional (from the privacy of my own home and without embarrassment). I was given a clear and honest explanation of the symptoms and how the treatments can help to combat these symptoms. Having tried other GP prescribed medication and over the counter remedies from Boots and many other chemists, even a Chinese Herbalist, with mixed results. I was naturally enthusiastic about something new. The knowledge of the trichologists and the staff online at The Hair Centre some of whom are speaking from personal experience alongside a scientific background, gives you confidence from the start. After only 4 months I saw new baby re-growth, I was sprouting new hair, I believe as a direct result of the combination of the treatment and the stress free approach. 18 months into my treatments and products now, I have a couple of areas where I am still obviously thinner and my scalp is still visible, but on the whole my existing and remaining hair is substantially thicker and healthier, and I know that the deterioration has stopped and my genetic hair loss pattern is now under control, thanks to The Hair Centre's products I am very happy with my new appearance. I’d recommend the treatment to anyone with hair concerns. All aspects of The Hair Centre are professional friendly and best of all effective. Do you have a problem with hair loss? Let us help you like we have helped others. Please do not hesitate to contact us on 0207 976 6868 or Click Here To Email Us if you are unsure of anything or require further advice regarding your treatment. I have suffered from severe eczema for most of my adult life. I guess some 20 years. I’ve literally tried every shampoo on the market here and in America, without any success what so ever. However, since I started using The Hair Centre’s No.4 and No.15 shampoo’s on alternate days along with No.8 for my irratation and itchy scalp, there has been an incredible improvement in the condition of my scalp. The plant based natural ingredients in the shampoo have a cooling, calming effect on my scalp, this has worked so well it is no longer inflamed and itchy. My hair too seems to be in beautiful condition. Obviously, I am benefiting from a healthier scalp. I have recommended The Hair Centre’s products to all of my friends, and I would happily recommend the No.4, No.15 and No.8 products to anyone with the same or similar scalp problem. Do you have a problem with hair loss? Let us help you like we have helped others. Please do not hesitate to contact us on 0207 976 6868 or Click Here To Email Us if you are unsure of anything or require further advice regarding your treatment. At the beginning of this year I noticed a thinning of my hair and decided to visit my GP for some advice as to the problem. After several visits without success I asked to be referred to a trichologist for a second opinion. My GP said there was nothing he could do as it was a waste of time and money. After getting no further help from my GP I decided to get a second opinion for myself. I had heard about The Hair Centre on the radio and decided to go along for a consultation. I was diagnosed as suffering from Alopecia Areata and after speaking to a trichologist I felt much happier and relaxed knowing there was some treatment that could help me. At first I was a bit apprehensive and worried it was not going to work but after just 3 months of treatment I can see a very noticeable change of hair growth and the treatment has been very successful as it has stabilised the hair loss. I am currently using a maintenance shampoo recommended by The Hair Centre at home and I am very happy with the results and will continue to use it after the treatment has finished in three months’ time as it has put my hair in a much healthier condition. Do you have a problem with hair loss? Let us help you like we have helped others. Please do not hesitate to contact us on 0207 976 6868 or Click Here To Email Us if you are unsure of anything or require further advice regarding your treatment. I am now delighted to say that my hair is thickening and, believe it or not, growing back! The overall condition of my hair and scalp improved greatly and I found it very reassuring to know that only natural products are used in the manufacture of The Hair Centre products. The knowledge of the trichologists and the staff online at The Hair Centre some of whom are speaking from personal experience alongside a scientific background, gives you confidence from the start. Since I started using The Hair Centre’s No.4 and No.15 shampoo’s on alternate days along with No.8 for my irratation and itchy scalp, there has been an incredible improvement in the condition of my scalp. We hope this covers everything, but please do not hesitate to contact us on 0207 152 4473 or Click Here To Email Us if you are unsure of anything or require further advice regarding your treatment.